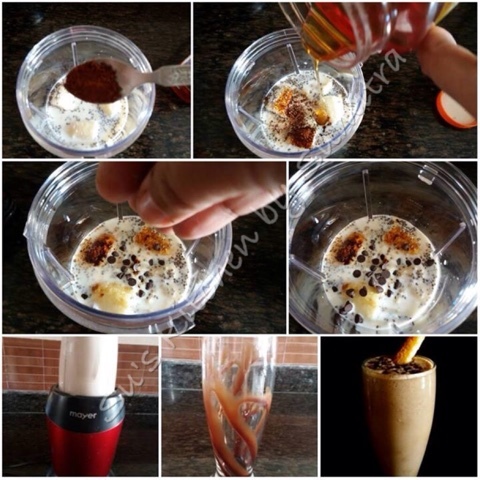 Take a blender. Add milk, banana, chia seeds, coffee powder, honey, 1 tbsp chocolate chips and few pieces of ice in the blender. Blend all the ingredients. Take a glass. Add the a tbsp of chocolate syrup. 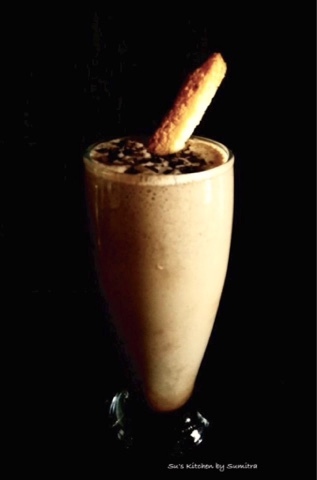 Pour in the smoothie in the glass and garnish with 1/2 tsp chocolate chips and cake toast. 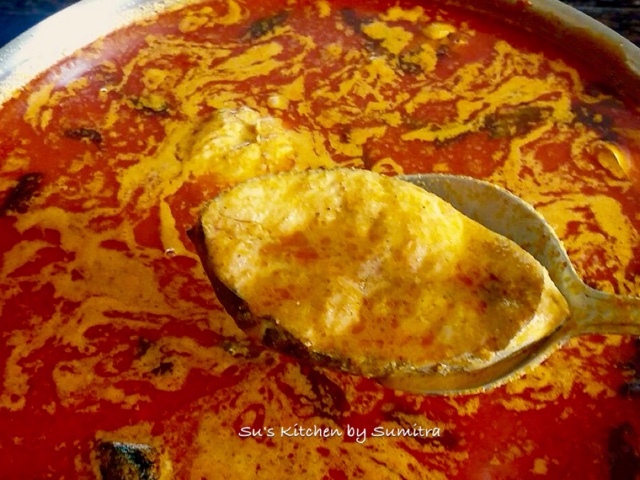 I absolutely love this egg curry or this Sri Lankan curry powder that I have used in this curry. 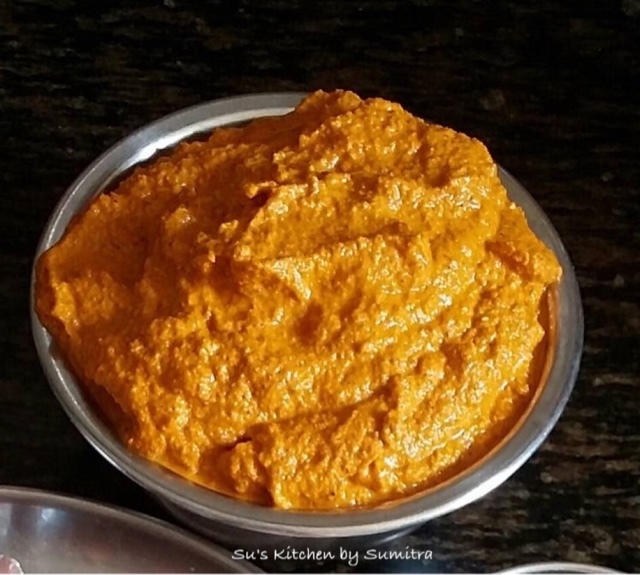 This curry powder can be used for any curry you make. 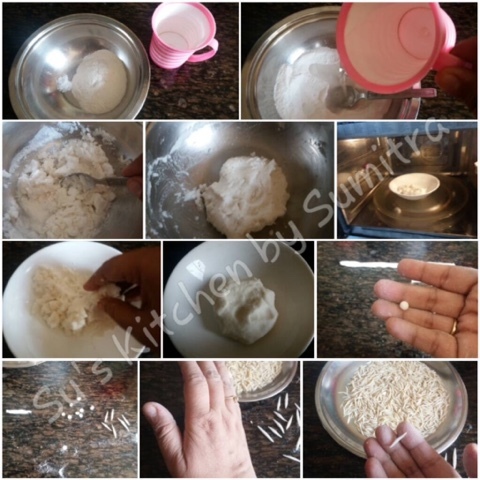 You can make this in large batch and it can be stored. Dry roast the curry leaves in a pan and keep aside to cool. In the same pan, dry roast all the whole spices and allow it to cool. In a grinder, add all the roasted ingredients including curry leaves and grind to make a powder.Store it in an air tight jar. Take a wok. Add oil. Let it heat. Fry the potatoes until light brown colour. Keep it aside. Give a slit on the boiled eggs. Fry the eggs till light brown in colour. Keep it aside. In the same oil, add the mustard seeds, fennel seeds, and dry chilli. Let it crackle. Add the curry leaves and sauté it for few seconds. Add the onion and sauté it till light pink in colour. Add the wet paste, stir and cook it for 2 minutes. 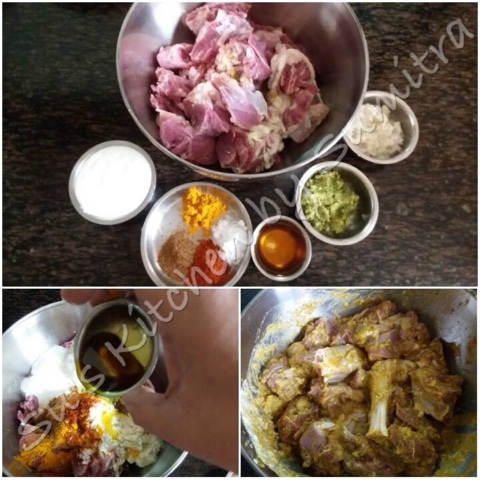 Add the chilli powder, turmeric powder, salt, Sri Lankan powder and pepper powder. 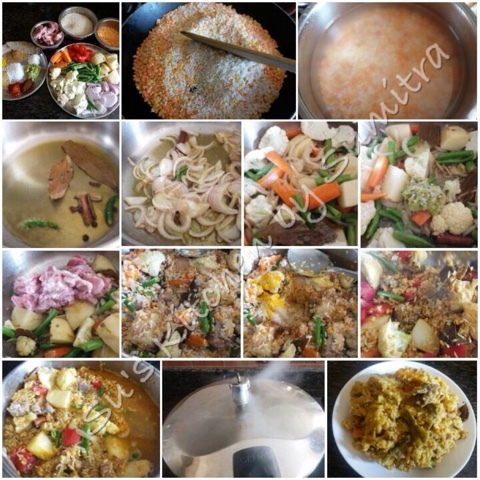 Stir and cook for 2 minutes. Add the potatoes, stir and add 4 cups of water. Cover and cook till the potatoes are cooked. Add the eggs, tomato, tamarind paste and jaggery. Stir and cook for another 3 minutes. 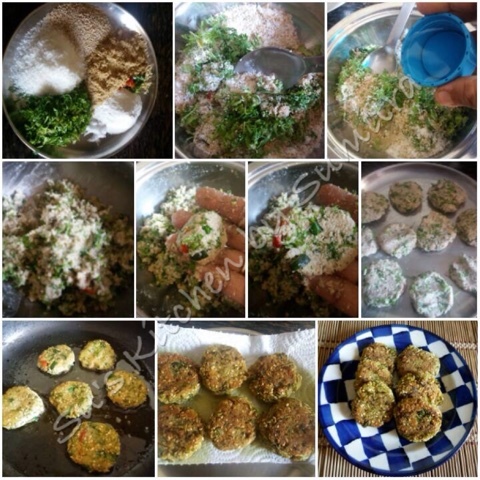 Garnish with coriander leaves before serving. P. S. Water can be added as per your requirement. 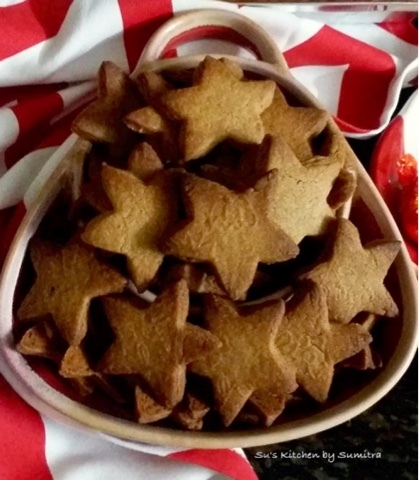 Speculaas cookie is a type of spiced short crust biscuit, traditionally baked on or just before St Nicholas' day in the Netherlands that is 5th December, In Belgium it is December 6th and around Christmas in Germany. Speculaas are thin, very crunchy, caramelized, slightly browned and, most significantly, have some image or figure (often from the traditional stories about St. Nicholas stamped on the front side before baking and the back is flat. 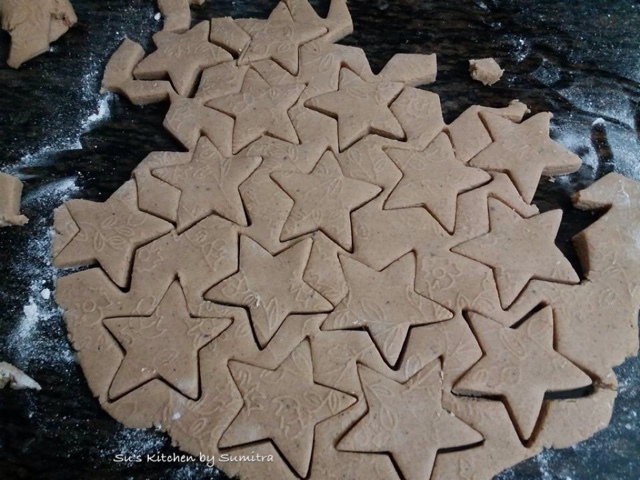 Traditionally speculaas are made by pressing the dough into a mold before baking in the oven. Using a springerle rolling pin (a rolling pin with a pattern carved into it) is an easy way to impress a shape into the cookies. If you don’t have a speculaas mold or a springerle rolling pin, you can just use regular holiday cookie cutters to make festive shaped cookies instead or just roll them out, and cut them into squares with a knife. While baking the whole house is filled up with aroma and makes you feel like holiday season. As Christmas arrives my memory runs down through those beautiful moments of my life where I stayed for so many years, a place where you could hear Christmas tune flowing in the air. Adult and children from different parish would walk down the road singing carols. There would be romance in the air. so nostalgic..... Every household would make sweets and cakes.... The aroma of baking would be everywhere. All the main roads and Gaothans would be decorated and lite up with colourful stars and lights. Food and drink would flow in parties along with the music and dance. More over fun to attend the midnight mass with friends. 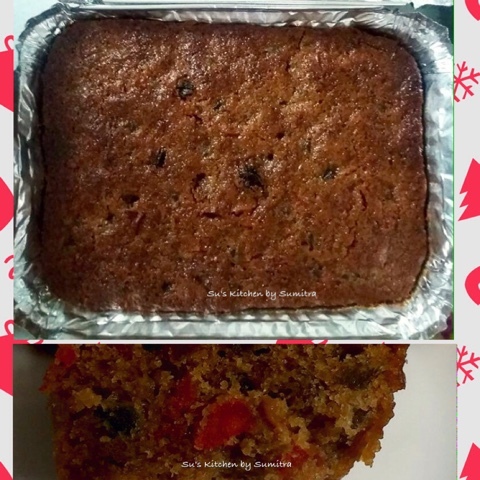 One of the must in the menu is the fruit cake. 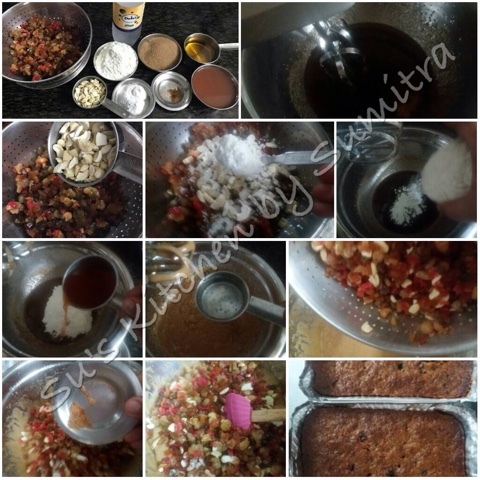 The dry fruits are soaked in alcohol for many weeks before makingthe cake, buy today, I made a cake without eggs and alcohol... with was equally good in taste. Pre heat the oven at 160 -180 degrees. 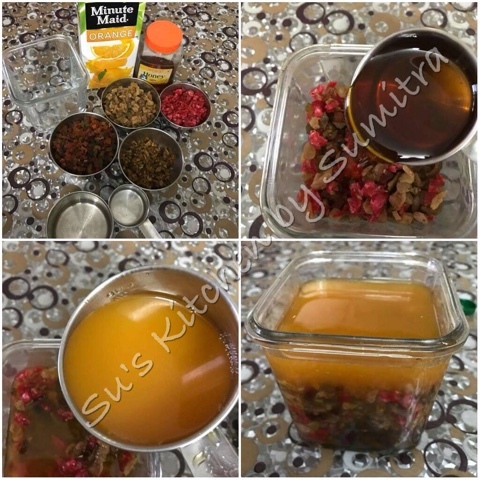 Mix all the dry fruits, orange juice and honey and keep it over night in the fridge. Take the soaked dry fruits and drain the juice out. Keep the juice and the dry fruits separately. Take oil and sugar. 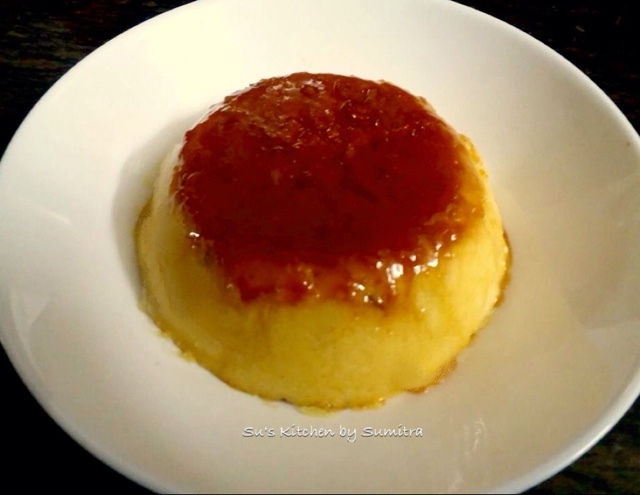 Beat it well till both the ingredients are well incooperated. 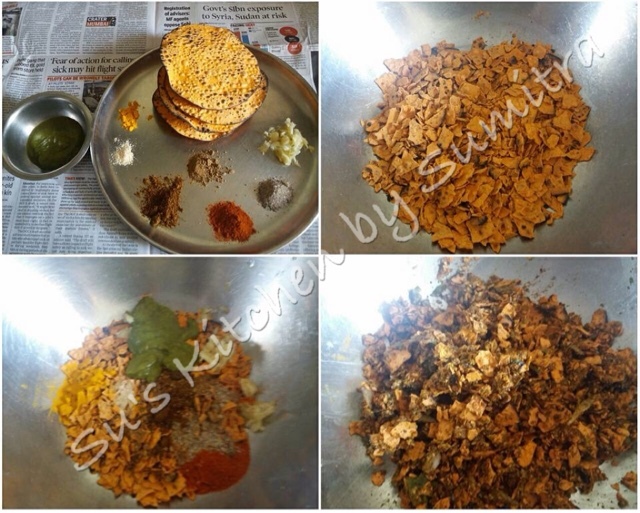 Take the dry fruits and the cashews and mix it. 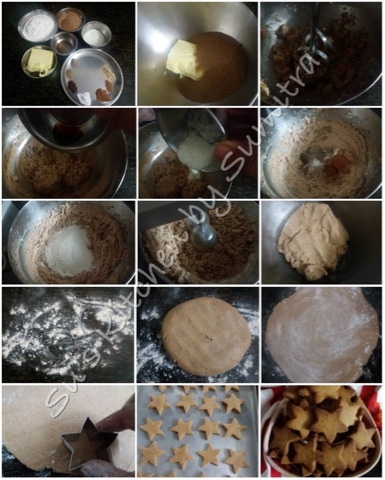 Sprinkle 2 tbsp of the flour into the dry fruits and mix it. Now take a cup of the juice. Add the juice into the oil and sugar mixture little at a time along with the remaining flour, baking powder, soda bicarbonate and salt and beat it. Add the mix spice powder and the dry fruits into the batter and gently fold in the batter. Add in 1/4 cup of the club Soda and gently mix it. Now take 2 mould of 500 grams. Grease the moulds. Add the batter into the mould. Fill in 3/4 of the size of the mould. Bake it for 45 to 50 minutes at 160 - 180 degrees. Insert a tooth pick and check. Cool the cake completely and then slice it. 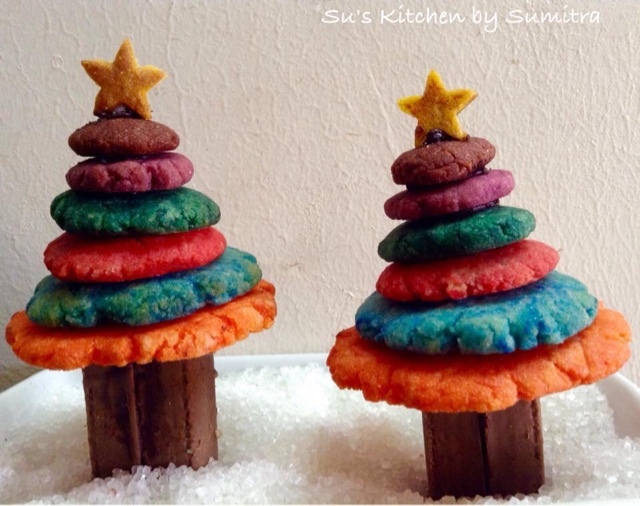 As Christmas is just round the corner, I wanted to share this colourful eggless cookie recipe which I had made 2 years back before having a blog. 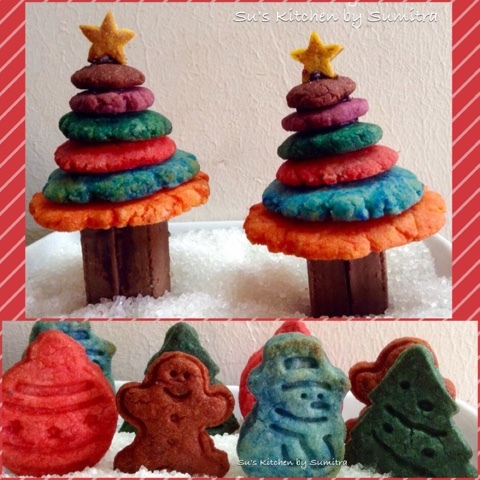 The Christmas tree cookie presentation idea was taken from Sandra Denneler. This is an excellent idea for decorating your table for Christmas parties. Beat the sugar with butter, curd and essence. 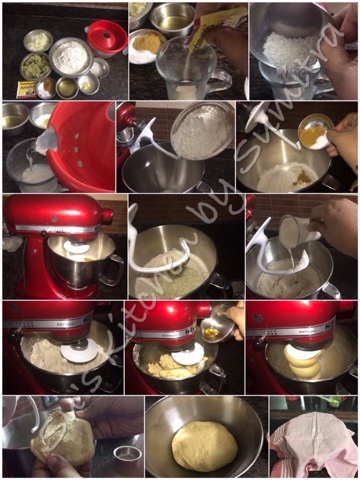 Now combine all the dry ingredients together, and then gradually add them to the sugar-butter mixture. 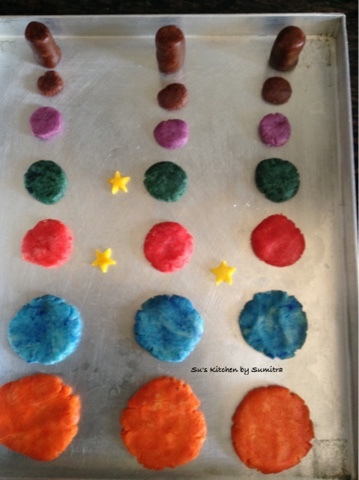 Split dough into 6 equal portions and keep a very small portion for the star.Add food coloring to each of the dough balls until desired color is achieved. Take 2 lime size portions from any of the coloured dough. Keep them on a plate. Similarly take another 2 portions from another colour dough. This portion has to be little smaller than the previous portions taken. Keep repeating. The portions keeps decreasing in size as we take different colour dough. The yellow colour dough can be cut into a star for the top. Flatten the dough balls. First place the bigger size cookies on the greased baking tray. Start with baking at 170 - 180 degrees for 3 minutes in a pre heated oven. Then remove the baking tray from the oven and add the next smaller size cookies, bake it for more 3 minutes. 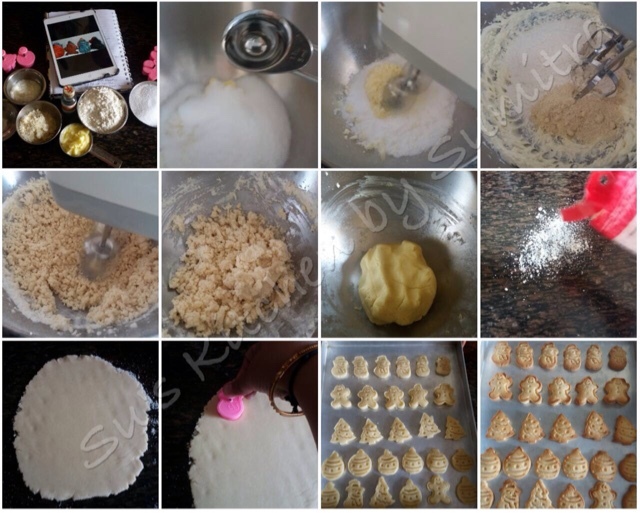 In the similar manner, keep adding the cookies and baking it for next 3 minutes. So the total time for baking will be 20 minutes.Cool of the cookies completely. Cut a full-sized perk bar in half. Get the 2 halves together and stick it with melted chocolate. Take a plate. Add the sugar for display into the plate. Add melted chocolate on top edge of the perk bar to secure the bottom cookie. For more stable trees, keep adding melted chocolate in between each cookies layer as you stack them. Stack the largest cookie in the bottom, graduating to the smallest size on the top. Add the star cookie on top. 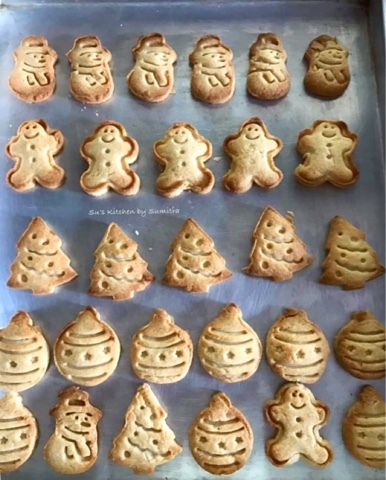 Take the leftover dough and roll it into a sheet and with the help of a Christmas cookie cutters cut out different shapes and bake it at 180 degrees for 15 to 20 minutes. Enjoy them during Christmas. 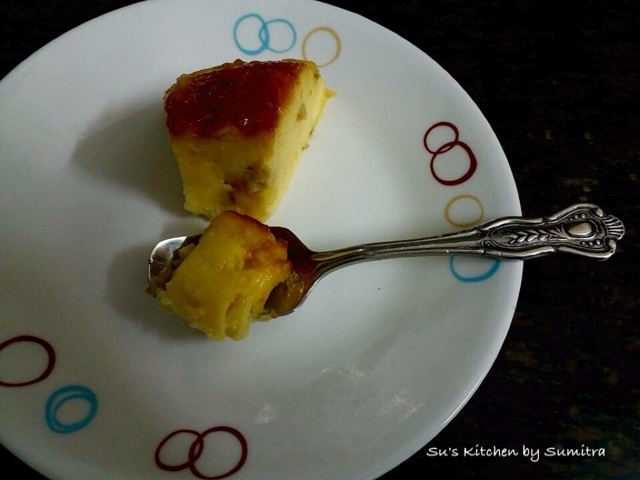 Chushi Pitha is traditionally made during Paush Sankranti. This is a Bangladeshi sweet dish. There many types of Pitha made during this season with the new harvested rice and date jaggery which is made during this winter season. 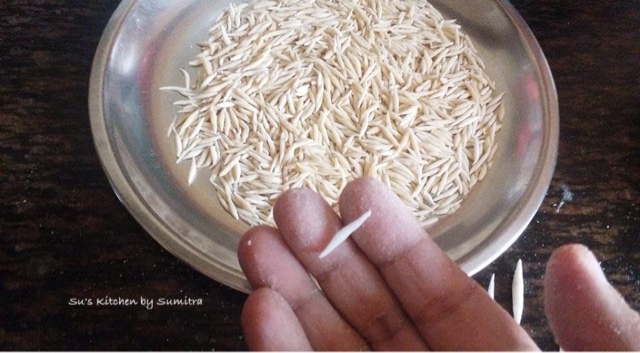 Chushi Pitha or Chutki Pitha or Chui Pitha has to be made in advance as the small rice dumplings are made first and then sun dried. It is time consuming to make them so the traditional method is becoming extinct. Now a days the dried rice dumplings are available in the market. 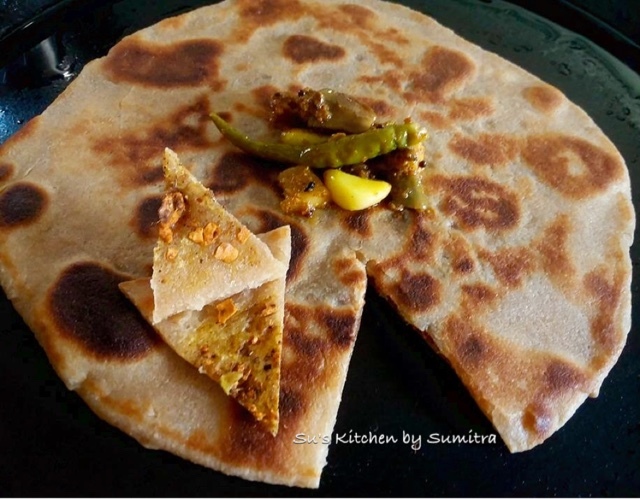 Traditionally it is made with Gobindo bhog rice flour or Basmati Rice flour. The dough is made by cooking the flour in hot water and then kneading it well. A pinch of the dough is taken and then shaped. 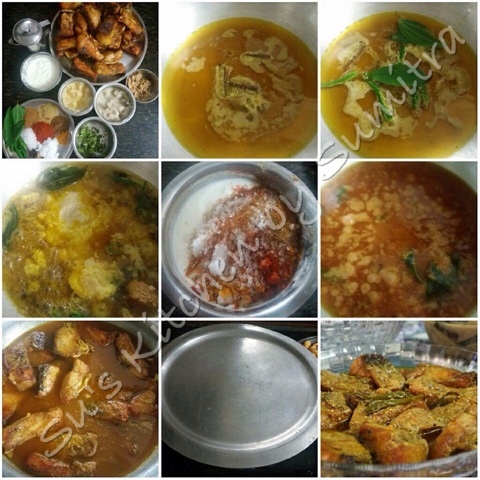 There are many traditional and faster ways of making it, but since I being a Prabasi Bangali (out of the state), I am not very acquainted with all the methods. The dumplings are sun dried and it can be stored. 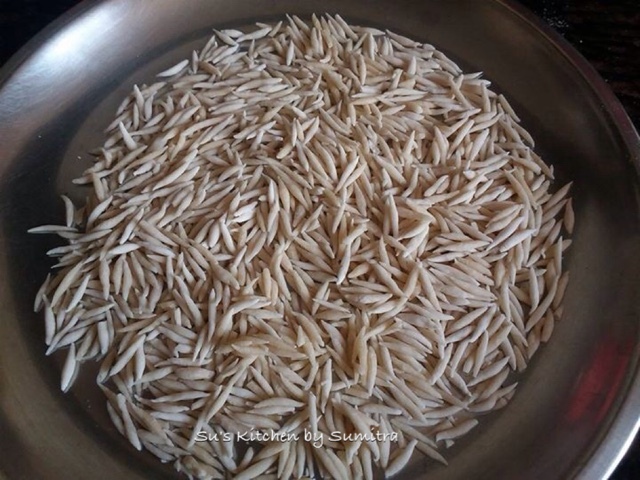 These are used to make Chushi Pitha Kheer. 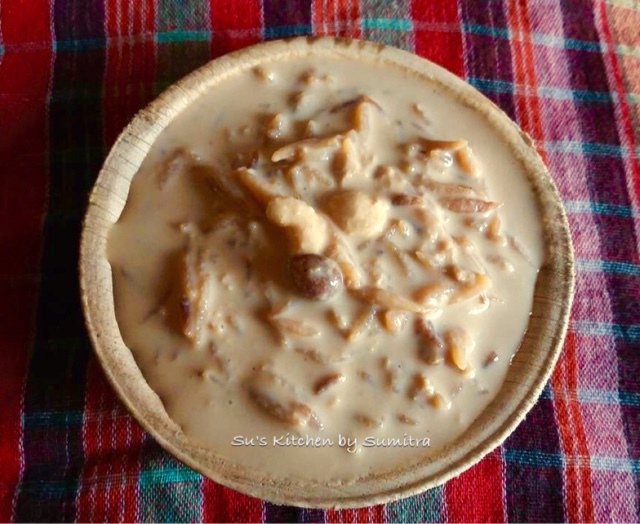 To make the kheer date jaggery is used as it is the season for this jaggery. 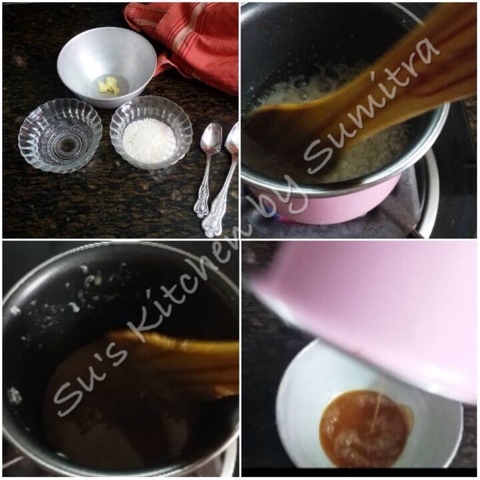 Milk is boiled and reduced and sugar and date jaggery is added to the milk, it stirred till the sugar and jaggery is dissolved. 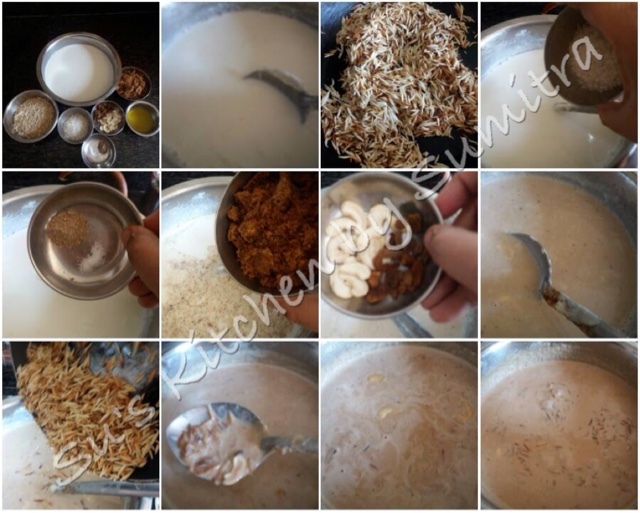 The dumplings are fried in ghee and added into the milk and cooked till the milk has slightly thickened. Take bowl. Mix 1/2 cup flour and salt. Add little hot water at a time and mix it till it forms a wet dough. Microwave the dough for 30 seconds. Let cool down a bit. Knead it well for 5 minutes. Cover the dough and keep it for 5 minutes. Sprinkle some flour on a platform. Take a small pinch of the dough and roll it into a ball. Keep it on a platform and with the help of the heel of the palm, gently roll it from the edge and make it into a oblong shape. Then turn the dough and using the heel of the palm, roll it from the edge. It is pointy at the edges and thick in the centre. Follow the same process to make the other dumplings. Sprinkle some flour on them and sun dry. These can be stored in a jar and kept until Chushi pitha payesh is made out of it. Take a heavy bottom pot. Let the milk simmer, stir it occasionally. Meanwhile take a pan. 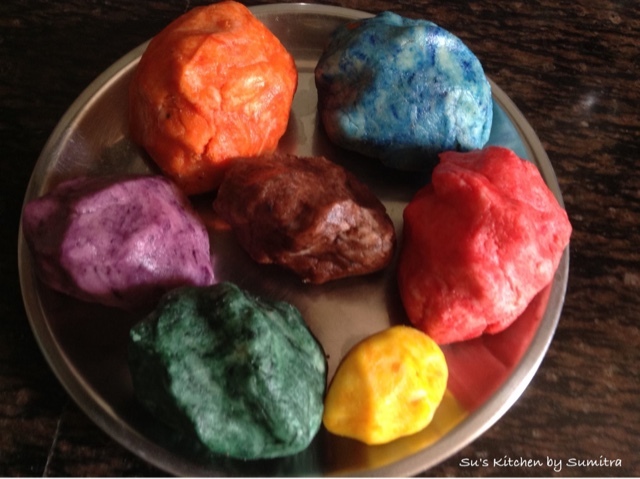 Add ghee and stir fry the Chushi pitha till light brown in colour. Keep it aside. As 1/4 cup of the milk reduces, add the sugar, cardamom powder, salt, jaggery, raisins and cashwenuts. Stirring the milk occasionally, dissolve the jaggery. 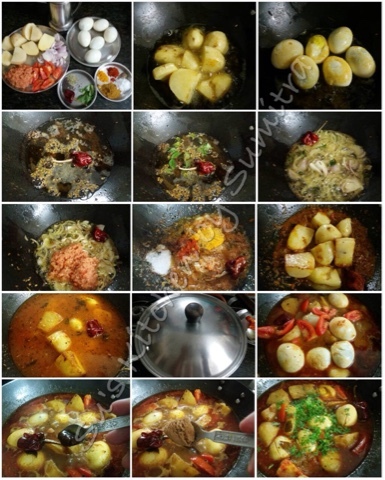 Add the chushi pitha and keep stirring it as it should not form a lump. As the milk thickens, switch off the flame and let it cool. If you feel that the chushi pitha has absorbed the milk, then please add some more milk and stir it. P .S. Some times due to the jaggery the milk curdles. So in that case if you are not sure of the jaggery, it is better to melt the jaggery with little water and then add it to the milk. 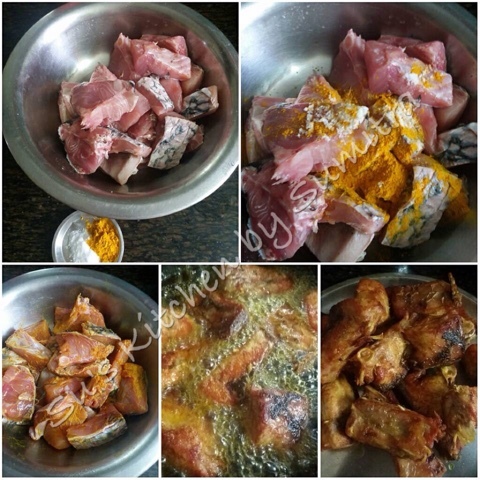 Narkle Postor Bora is a delicacy from Bengal. 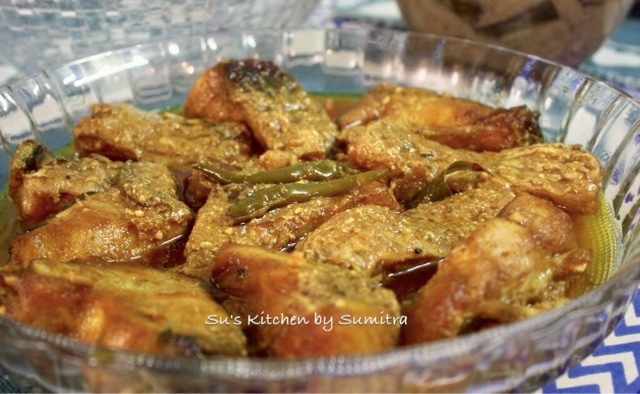 It is a side dish served with hot dal and rice. 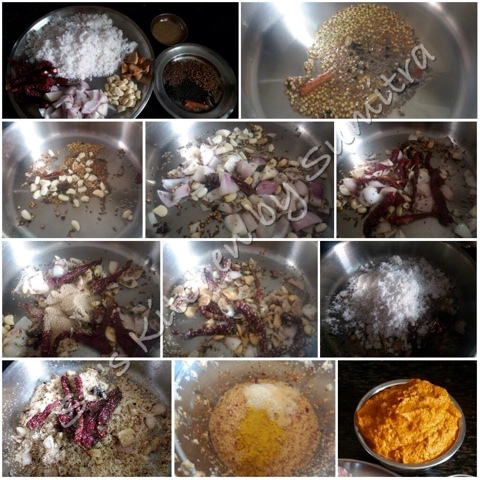 My Ma use to prepare this dish adding coriander leaves and sesame seeds into it mostly on a vegetarian day and I use to enjoy it with Korair (Urid) Dal and Aloo Posto. Usually the poppy seeds are ground into a paste and then mixed with the other ingredients. Today I have ground the poppy seeds into a powder and mixed it with the other ingredients. Take a mixing bowl and add all the above ingredients except oil. Add just enough water to make a dough. Divide the dough into lime size equal portion. Take a portion and make a ball and flatten it. Repeated the process for other portions too. Heat oil in a fry pan. Place the fritters in the pan and fry it on medium low heat till brown on both the sides. 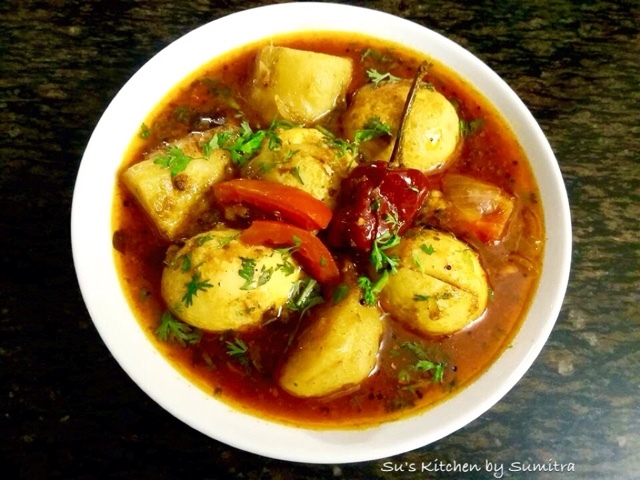 Serve it hot with rice and dal. Take a baking dish. Grease the base with butter. Arrange the bread slices at the base. Take the green leafy purée and mix it with the melted butter. In a bowl break the eggs and mix the green leafy mixture with eggs. 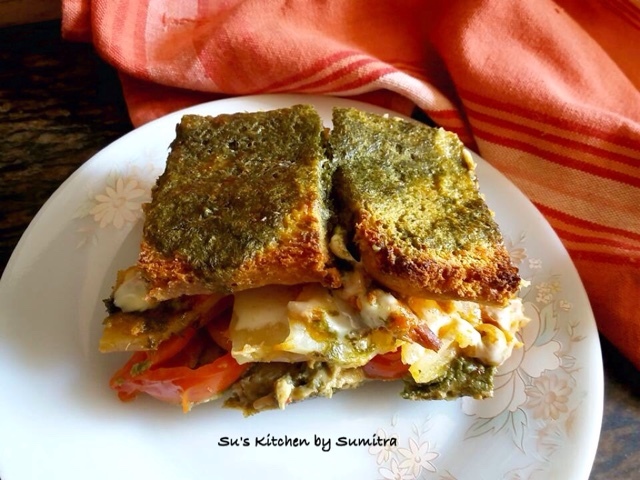 Pour 1/2 of the green leafy and egg mixture on the bread slices. 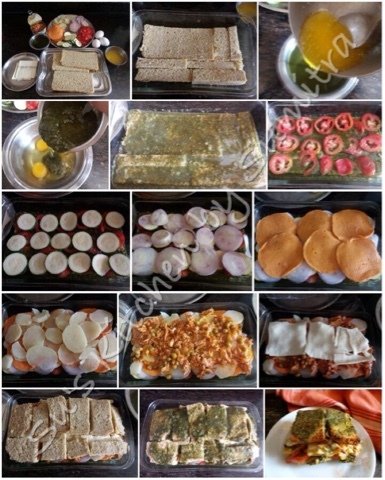 Arrange the sliced tomatoes, zucchini, onions, chicken salama and potatoes in the baking dish one after the other. Spread the canned tuna over the vegetables. Arrange the cheese slices. Cover up the cheese slices with the bread slices. Pour the remaining mixture of green leafy purée and egg. Bake it for 20 minutes in a preheated oven at 180 degrees. Remove it from the oven and let it stand for 10 minutes before cutting and serving it. 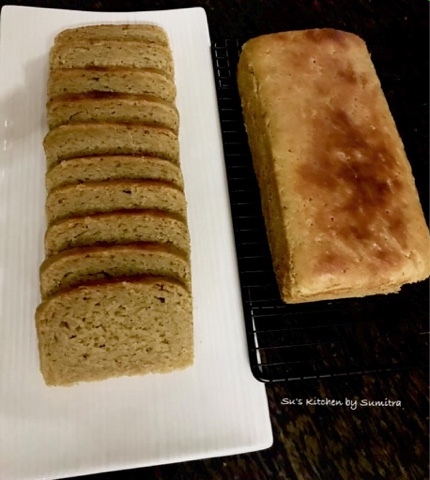 Since I had no time for the 2nd proofing and then baking the bread, I kept the dough in the fridge overnight and followed the rest of the process in the morning. The taste of the bread was good and the smell of the yeast was quite strong. Mix yeast, sugar and 1/2 cup lukewarm water in a cup. Keep it aside to rise. 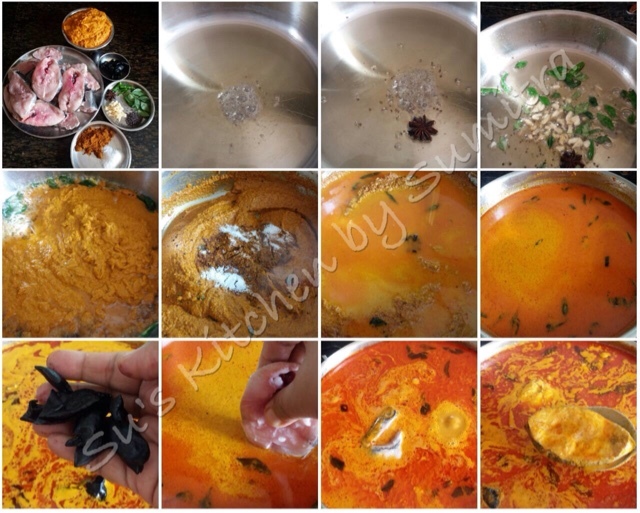 Mix the flour, salt and curry powder together. 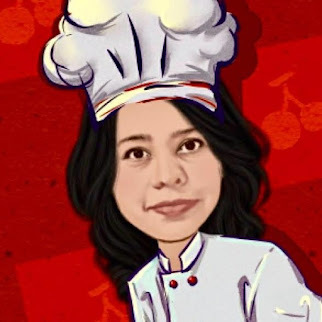 Add the yeast water, cheese and mashed potato to the flour together and mix it. . Add remaining water little at a time and start kneading. Add a tbsp of oil and continue kneading for 10 minutes. Take a small portion of the dough and do a stretch test. Apply oil on the dough. Cover and keep the dough aside for an hour for it to rise and then in the fridge overnight. 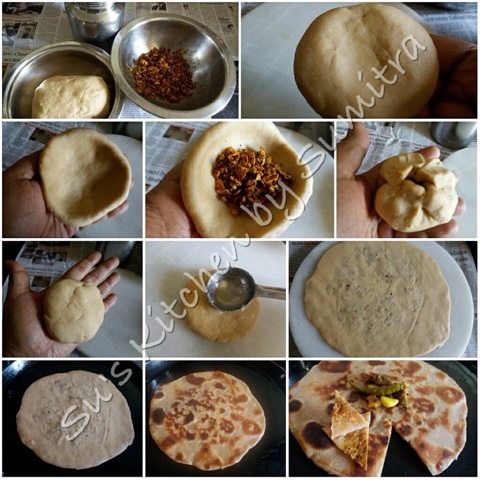 In the morning remove the dough from the fridge and keep it out till it comes back to the room temperature. Lightly sprinkle some flour on the platform. Take the dough and knead it for 2 minutes. Divide the dough into 2 equal portions. Take 2 bread tins and grease them with oil. 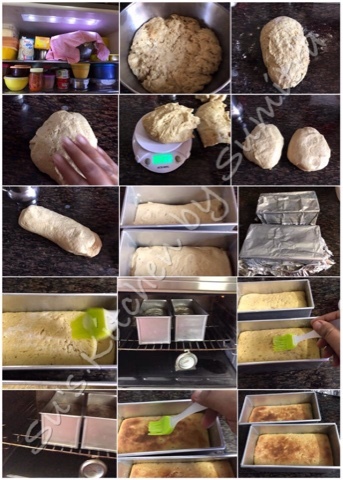 Shape the dough and place the dough into the greased bread tin. Repeat the same with the other dough. Cover and keep the bread to rise. 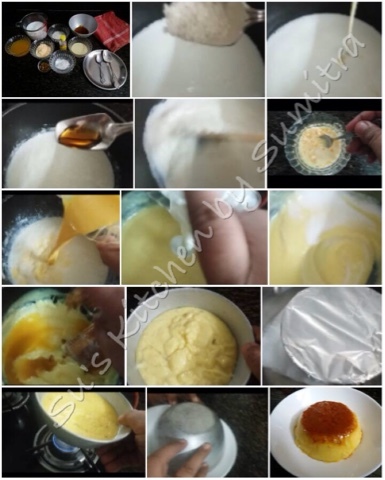 Brush with milk and butter mix. Bake it at 180 degrees celcius for 20 minutes in a preheated oven. In between the baking after 10 minutes remove the bread and brush it with remaining milk and butter and continue baking. Remove it from the oven and let it cool before unmoulding. Let it cool for some more time before slicing. 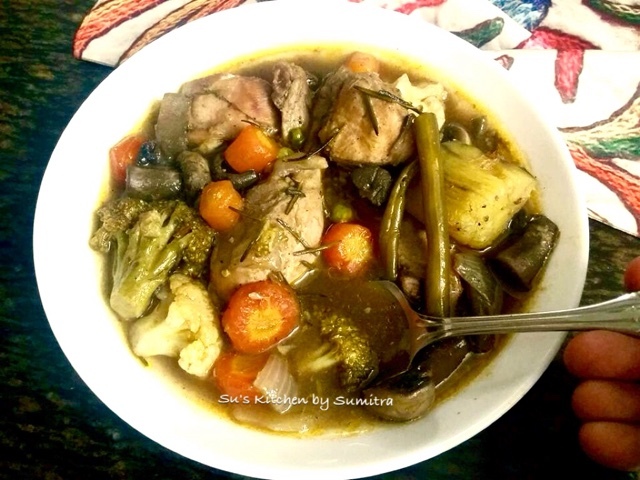 In this dish the mutton has to be well marinated. 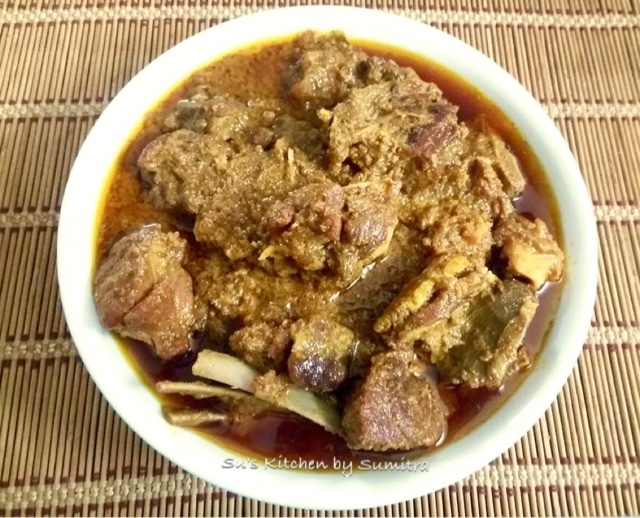 While cooking the mutton is sautéed well that is called Koshano in Bengali and hence the name Khosha Mangsho... 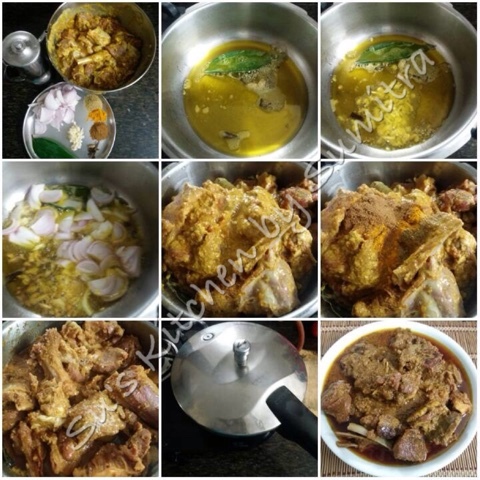 Since the mutton is marinated well, the mutton cooks in its own juices, so no water is added while cooking. 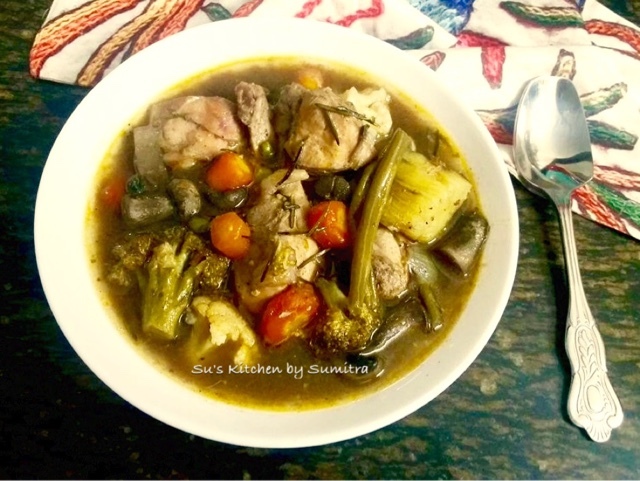 Usually it is slow cooked in a pot, but due to time constraint, I have cooked it in a pressure cooker. 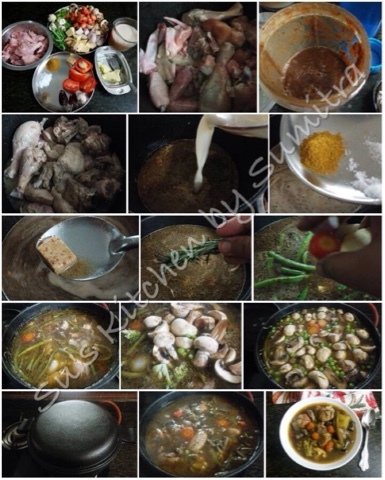 Mix all the above ingredients well and let it marinate for 5 to 6 hours. Take a pressure cooker, add oil and let it heat up till smoking point. Reduce the flame, add cardomom, cloves, cinnamon, peppercorn and bay leaves. Let the whole garam masala crackle. Add the garlic, sauté it for a minute. Add the onions and sugar. Sauté it till light brown in colour. 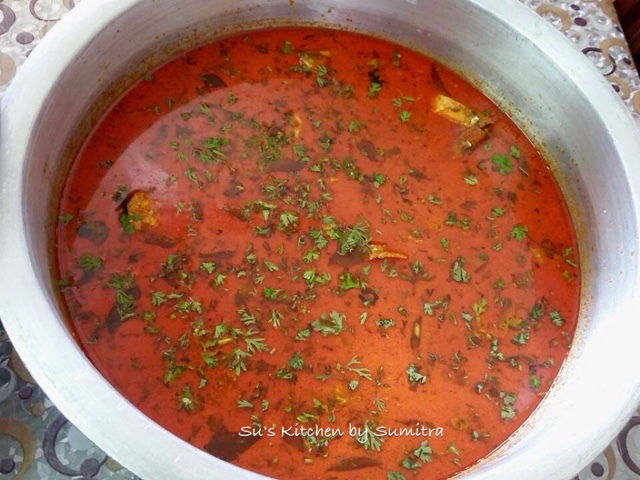 Add the marinated mutton pieces. Stir and cook on low flame for 10 minutes. Add the turmeric powder, cumin powder and coriander powder. 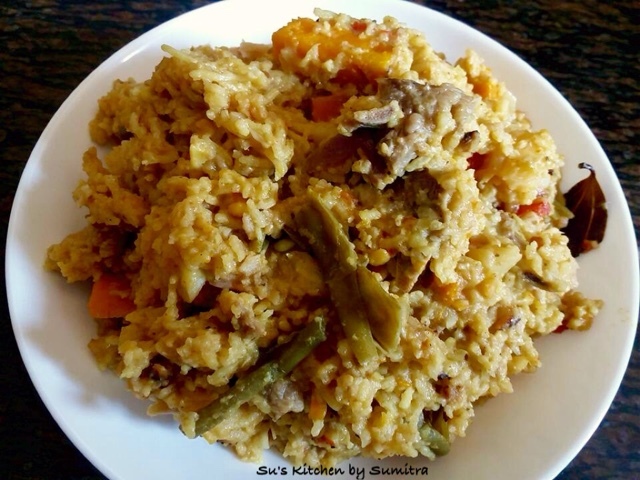 Stir and cook it for 10 minutes more. Pressure cook the mutton for 4 whistles. Let the pressure release. Open the lid of the cooker. Sprinkle the powdered garam masala on top of the mutton. 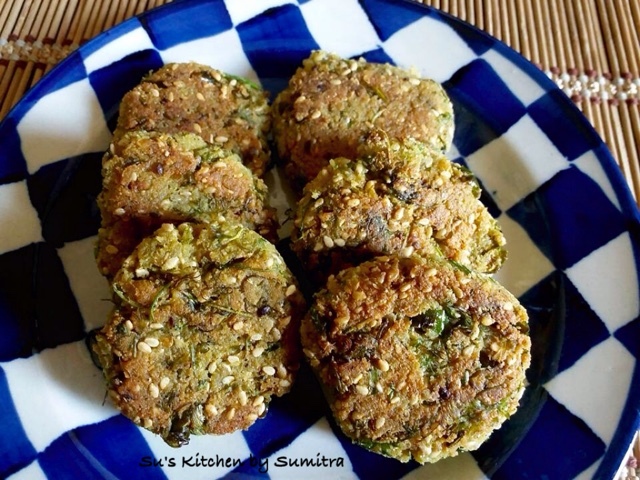 Serve it hot with Mughlai paratha or Luchi or Roti.